I Am Pleased With The Experience! From the minute I arrived to your store for the first time, I was greatly impressed! The furniture was beautiful - my sales person, Andi was delightful and knowledgeable. I found items I wanted to consider and came back a couple of more times before I made my decision. I am pleased with the experience! From the minute I arrived to your store for the first time, I was greatly impressed! 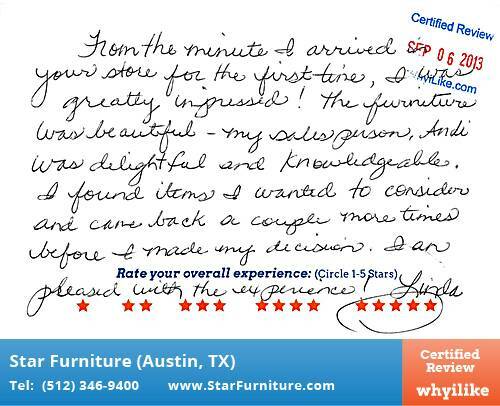 The furniture was beautiful – my sales person, Andi was delightful and knowledgeable. I found items I wanted to consider and came back a couple of more times before I made my decision. I am pleased with the experience!